Who is AdPharm intended for? What advertising markets are showcased AdPharm? Does AdPharm showcase only Direct-to-consumer (DTC) advertising? Are all published pharmaceutical ads in this gallery? In what year did Adpharm start gathering ads? Can I submit ads to be showcased on AdPharm? Can I advertise prices for drugs or treatments available online? Can I use AdPharm to self-diagnose and determine which treatment is best for me? Why are there ads with no description or keywords? Are the TV ads really HD? Where is the Prescribing information for the products featured in the ads? How can I contact AdPharm's managers? How do I save a picture to "My Collection"? Ads in other languages than English. Why was the intermediate image preview removed for guests? Why do I get errors or empty results when I use the search function? Missing page elements in Internet Explorer 9? How can I download the full-sized version of an ad? I can't view a video or flash file, what can I do? How can I get an ad or multiple ads without the watermark on it or them? Links to other ad galleries. Ads taken from unverified sources. Can I use my email address to login? When will I get access to the gallery content once I’ve purchased a subscription? When can I expect an answer from Adpharm? What if I forgot, or want to change my password? What if I changed my email address? Why can't I see who else is on the site? Will I be notified when my subscription runs out? Will I get a receipt for my subscription? I've completed payment for my subscription, now what? Why can't I log-in after renewing my subscription? Why should I log-out of the ad gallery when I'm done? Can I use the site with multiple computers? I've been banned, what do I do? So my subscription allows up to 3 or more users logged-in at the same time? How can I search the ad database? Are there categories in the ad gallery? Do you have a page listing all brands and linking to them? Can I search by publication or airing dates? Is there are list or search function just for ad taglines? Why do I get errors or the wrong ad when I click on a thumbnail after a search? Can I use full sentences in my searches? What kind of keywords can I use for a search on AdPharm? AdPharm is an online pharmaceutical and healthcare advertising gallery and archive. 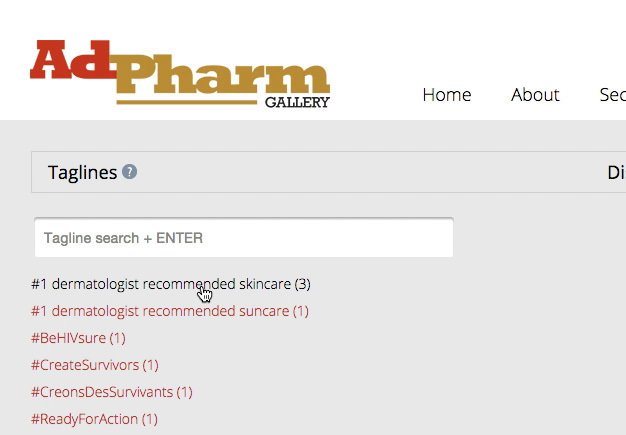 Most ads showcased contain information (brand name, generic name, year of publication, what they are for, etc) that is stored in a database, which makes it searchable through the AdPharm site search function (log-in needed). AdPharm is intended for advertising agency creatives, account services and also to pharmaceutical companie's marketing and communications specialists looking for specific pharmaceutical advertising examples. On AdPharm, they can conduct research on advertising that has been published in the past as a reference for current or future projects. Whether it is to find ads for similar drugs or treatments, to see what the competition has advertised in the past or even to see ads that were published in the past for their own brands in different markets. Ads shown on AdPharm come from many countries such as: USA, Canada, UK, Ireland, France, Belgium and Australia. We are working diligently to increase our database by expending those markets and others as well. AdPharm showcases mainly ads from two groups: Direct-to-consumer (DTC) and ads targeted to healthcare professionals (HCP). We also gather healthcare and pharmaceutical ads for the services industry (advertising agencies and other types of services) among others. That would be the ideal situation but it is unfortunately not the case. With many new magazines appearing every year it's difficult to keep track of all publications, especially worldwide. We do gather ads from many journals (DTC and HCP) of many countries and our sample is growing continuously. Before Adpharm was... Adpharm, it was a private collection of ads gathered by a small group of creatives that were interested in building an archive that would help inform the projects they were working on for their respective agencies or clients. That private collection, which is still included in today's Adpharm was created around 2005. Interest outside of the core group grew with time and Adpharm became a site that all marketers and communicators could subscribe to as of August 2009. Because it started officially in 2009, users can expect to have a good sample of ads from that year up until now. Yes you can, simply visit the "submit an ad page" and follow the instructions. Apart from a few weeks when we close for holidays, the gallery is updated daily. We try to add new ads the day we get them, if not, within a few days. You will also notice that ads from earlier years occasionally appear in the latest ads section (log-in needed). That's because we also gather ads that were published prior to the start of AdPharm or ads that we have missed since then. AdPharm is not an online pharmacy nor will it promote any online pharmacies. AdPharm is not intended to the general public and it is not managed by licensed healthcare professionals. The material shown on AdPharm is for educational and research purposes only and is intended for communications professionals. If you believe you suffer from an undisclosed illness, please consult your licensed healthcare professional. Due to timing, sometimes we cannot add the information at the same time as the ads come in. Since we want our users to have access to a maximum of material at all times, we post the ads immediately when we get them and add relevant information later. The drawback to this is that the ads with no information only show up in searches when users type in a specific brand name. The most recent ones are. There are still some recent commercials that can be of standard definition (SD). The reason for this is we haven't managed to capture it on a HD channel or it played in standard definition on a HD channel, which happens quite a bit. The definition on the site says that the size is 700 X 400? This is the size it's shown within the site. If you download it or play it full-screen, the file should be 1920 X 1080. Since AdPharm is a site that showcases creative and messaging, including prescribing information would clutter the site. As mentioned in the forum post Who is AdPharm intended for?, AdPharm is market intelligence tool and an inspirational showcase for marketing and communications professional. AdPharm is not intended for self-diagnosing illness or as a replacement to seeing a healthcare professional. Just email us at admin@adpharm.net. This feature lets a logged-in user store/collect multiple files so they can consult them at any time. Users can have multiple collections which can be accessed via the "My Collections" link located in right-hand side menu when logged-in. Click on a picture and click on the "picture info" link (Picture information); scroll down to the picture information set and click "Add to My Collection". You can also click on the small star located above the ad as seen below. IMPORTANT: Cookies must be enabled and the cookie from this site must not be deleted. This feature was removed due to various issues reported by users based on computer and browser settings. We are very sorry for any inconvenience this may cause. The easiest way to download the files included in your collection is to open each file in its own browser tab, or window and click on the "download original file" link located in the "file information" section. Click on a thumbnail and choose a rating from the "Rate this file" section. Direct upload is not possible but submitting an ad via email is possible. Please click on the "Submit an ad button"
Cookies are a plain text piece of data that is sent from a website and is put on to your computer. Cookies usually allow a user to leave and return to the site without having to log-in again and other various chores. More importantly, if cookies are not allowed in your browser, you won't be able to see any of the ads on AdPharm because your browser will have "forgotten" that it is logged-in the minute you leave the log-in page. More details on the cookies used on adpharm here. Please refer to your browser's "help" section to turn on the cookies function. This shows the last additions to the site. The gallery has ads in various languages. The bigger portion is in English but you can also find French, Spanish, Romanian, Russian ads. To find ads in specific languages, type in any keyword you want (i.e. brand name, company name, year, etc) and add the language name in its English version. For instance, your looking for a Lipitor ad from France in French language, type Lipitor France French (no quote marks) in the search field, Lipitor France Francais would yield not results. 1- it created some stress to our web server which in turn was detrimental to our paying users. 2- there was content theft. 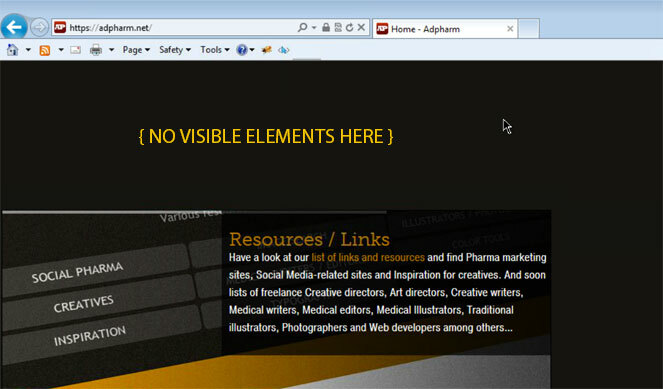 Adpharm may appear blank or might not display correctly if you are using Windows Internet Explorer 9. This is because some style elements only work with newer browsers. We recommend upgrading to IE 10 or 11 if you can or switching to Google Chrome or Firefox. In case you cannot upgrade your browser, there's an easy fix. When Internet Explorer recognizes that a webpage is not compatible, you will see the Compatibility View button on the Address bar as seen below. All you need to do is click the Compatibility View button in the address bar. In Compatibility View, websites will be displayed as if you were viewing them in a previous version of Internet Explorer, which ironically should correct display problems. You don’t need to click the button for a site after you’ve done it once—the next time you visit the site, Internet Explorer 9 will automatically show it in Compatibility View. To be able to download the full-sized version of an ad, you need to be logged-in the gallery first. To download the full-sized version of an ad, scroll down to the "File information" section under the ad on the description page and click on "Download Original File". This will download the high-resolution (print ads) or High-definition (TV) file in your download folder on your computer. This may be a browser issue or a mime setting that may be missing in your browser. To overcome this issue, you can either resolve the browser issue on your end or download the file directly on your computer and play it in your favorite browser directly. To download a file, follow the instructions that can be found here. To get ads without the watermark, you will need to be logged-in first. The original, high-resolution files do not have any watermark on them. Users with a subscription can download the files by following the instructions found here. When logged-in, users can create email alerts for specific brands, companies, therapeutic categories, etc. The Alert manager is located in the right-hand side menu. By default, users have no alerts set-up. To create a new alert, go into the Alert Manager. Once in it, click on “Add New Alert”. Add one or multiple keywords separated by a comma. Click “Add To List” and then an “Alert Name” is added. A description can also be added. Similarly to the site search function, the more keywords added in a single alert, the narrower the search results will be. As an example, if you add two keywords such as "Viagra" and "Cialis" in one alert, you are very likely to never receive any alerts since both brands are competing against one another. So if you want to receive alerts for both brands, then you should create to separate alerts, one for each brand. Users receive alerts immediately when an ad matching the alert is added to the gallery. Users can create as many alerts as they want. Alerts are sent only when new ads are added to the gallery. So if a user adds an alert, he/she will not get alerts for all the associated ads that are already in the gallery. If an older ad is sent, that would be only because the details of that ad have changed. All alerts will come from email address support@adpharm.net. To prevent the alerts from going in the junk mail folder, this email address should be added to the user’s address book or junk mail filter white list. Occasionally we get backed up with many ads to include in the gallery at once. When a situation like this happens, we insert the new ads in the gallery with only minimal information so subscribers can see and download them as soon as possible even if the entry is not complete. In September 2013, we started including brand links to other ad galleries in our ad details pages. Ads that were included prior to September 26, 2013 don't have those links. This is a service to our subscribers to help complement searches on specific brand. One of those linked sites is MOAT, a free online consumer display (web banner) ad search engine. Ads of the World is also a free online ad gallery mainly for consumer ads. They have print, web and TV ads. One thing to consider is that although most ads included in Ads of the World have been published, some weren't and may have been spec work done in design or advertising school. Finally, iSpot.tv is also a free online TV commercial gallery where you can find, share and track TV spots. Occasionally we include ads taken from other sources than our own in an effort to bring our users a maximum of inspirational materials in one place. It is important to note that we cannot be absolutely sure of the provenance of these advertisements, so please use with caution. Said ads are clearly identified so there should be no confusion for the user. AdPharm is now a paid-subscription service. Since pharmaceutical advertising is a niche category, displaying advertising on the site did not bring enough revenue to be able to keep AdPharm running. Simply go to the subscription page and fill out the required fields. If the links on the subscription page do not work properly in your browser, you can also send us an email at sales@adpharm.net with the following information and we will send you an invoice that you can pay online with a credit card. If you are not the person for whom the subscription is purchased, which name and email address should we associate with the account? After completing your subscription and payment, we will send you your access details within 24 hours via email. If you don't receive it within that timeline, please check your junk mail folder. If it's not there, please email us at sales@adpharm.net using the email address associated with your payment. If this is for a renewal, please note that we sometimes change passwords when renewing accounts. So please look for the email with your new password after renewing your subscription. IMPORTANT: Cookies must be enabled otherwise your browser will not be able to keep you logged-in. Upon completion of your payment, you will be redirected to a page containing a temporary access to the full content of the site. You will then receive an email from us with your official user name and password within the next working day after receiving your payment. If it's for a renewal and your previous subscription is still active, you should be able to continue using your access without interruption. An email will be sent to you with an official receipt and further instructions. If your previous subscription has expired, there may be a slight delay before your access is reactivated. In that scenario, you can use the temporary access that will be provided to you once you return to adpharm.net after your payment. Please note that the access details will be sent to the email associated with the payment. If you would like to associate the account with a different email (i.e. account purchased by one person but used by another), please send us an email at sales@adpharm.net mentioning the email address to be changed and the new email address to be associated with the account. Our sales team can be reached via email (sales@adpharm.net) Monday to Friday from 9AM to 5PM (EDT - Eastern Daylight Time). When can I expect an answer from Adpharm if I email them? Our sales (sales@adpharm.net) and support (support@adpharm.net) team can be reached via email during work days from Monday to Friday, 9AM to 5PM (EDT - Eastern Daylight Time). So if you email us during the week-end, you can expect a reply the following Monday before 5PM EDT. Please note that we answer users with subscription first. We reserve the right to not answer all inquiries from non-subscribers. If you require a new copy of an invoice that was issued by the credit card processor, please contact them directly and they will resend you your bill. We have requested this on behalf of our customers before and were indicated that only the actual customer can request a reissue. If you need to resend you an official receipt, please email us at sales@adpharm.net using the mail address that is associated with your payment and include your user name. As of October 1, 2011, sales taxes are applicable for buyers located in following Canadian provinces: British Columbia, Ontario, Quebec, Nova Scotia, New Brunswick, Newfoundland and Labrador. Customers from other countries than Canada don't pay tax. Canadian customers will receive an invoice with tax numbers via email in addition to their payment receipt. Please note that Adpharm is owned by Outbreak Communications Inc. Does your browser allow cookies? If not, please refer to the following FAQ entry: What are cookies? Did you subscribe and go through the process of paying for one of the plans? As of August 16, 2009 AdPharm is a paid-subscription service. If you have not received your log-in details within 24 hours after your payment, please contact us at: sales@adpharm.net using the e-mail account that was used for your payment. As of July 2013 it is not possible to log-in with your email address as user name. You can log-in using the user name provided to you. If you have forgotten your user name and have deleted the email we sent you with your access details, please email us using the email account with which you have purchased your subscription and we will resend you your access details. Make sure that your browser allows cookies. Log-ins using your email address have been deactivated. Please use the user name provided to you when you purchased your subscription (see "Logging-in with your email address" above). Are you sure your subscription hasn't expired? Although we send renewal messages via email, sometimes those messages end up in the junk mail folder. Accounts are removed from the system after expiry, so even if the subscription has been renewed, the user name and password you had may not work anymore. If this is the case and you have not received your new access details, please email us at support@adpharm.net. If your password stopped working right after renewing your subscription, please check the payment acknowledgement email we have sent you shortly after completing your payment. A new password may have been assigned to your account. You can also try emptying your browser cache and deleting your cookies, which can solve some login problems. If you still have log-in issues after trying all of the above, please sent us an email at support@adpharm.net with the issue, and your user name. To get a new password, please request it by emailing us at admin@adpharm.net using the email associated with the account. If you do not have access to the email associated with the account, please ask the person that owns that email address to request the new password. New passwords are generated on our end by a random string generator and cannot be predetermined. Email us and include your user name and the email address that was used to register. We will make the change on our end. We value our users' privacy and therefore we do not list current users online nor do we make our users list available. AdPharm does not use an automatic renewal subscription service, therefore you do not need to cancel your subscription or account, you won't be automatically billed for a new subscription at the end of your term. When your subscription runs out, your account will simply be deactivated. Subscriptions are not refundable as stipulated on our Payment Terms. If ever you wish to delete all records of your subscription to the site, simply e-mail support@adpharm.net with your request and we will delete your account immediately. Subscribers will be notified a few days prior to the end of their term when logged-on AdPharm.net and via email. Yes. We send receipts upon completion of payment. Please note that this is not an automated process, therefore your receipt or invoice will be sent shortly after your payment has been confirmed, during workdays. After completing your subscription, you will receive a user name and password from us via email within 24 hours. Please note that the access details will be sent to the email address specified on the subscription request. If you did not receive your access details within 24 hours, please have a look in your junk mail folder. If it's not there, please contact us at support@adpharm.net using the email address associated with the account. For renewals: If you renewed prior to the end of your subscription, you should be able to access the gallery using your already existing user name without any disruptions. Please note that we occasionally change passwords upon renewal. If you cannot log-in after your renewal, please look for an email from us with your new password. If you renewed after expiry of your prior subscription, there may be a short delay before your full access is reinstated. If you renew prior to the end of your previous subscription, you should be able to access the gallery without any disruptions. Your new subscription term will be added at the end of your previous subscription. Please note that we occasionally change passwords upon renewal. If you cannot log-in after your renewal, please look for an email from us with your new password. If you renewed after expiry of your prior subscription, it can take up to a full working day before your full access is reinstated. If you leave the site (close the window or quit your browser) and plan to log back in in the next few minutes, you should log out first. Depending on how soon you come back to adpharm.net, you may be locked out for a few minutes. This is because the system thinks that there's already someone logged in with your credentials. This lock-out period should last no more than a 15 to 20 minutes from the moment you left the site while logged in. If you cannot log back in after 30 minutes, please email us at support@adpharm.net and we will sort it out. Users with paid subscriptions can log in from the office and then at home or any other place. Just make sure to log out before changing to another computer or device. If you forget to log out and get a warning message saying that someone is already logged-in with your user name when trying to log back on, just wait a few minutes and you will be able to log back in. There are a few reasons why your user name may have been banned or your access revoked. The most common reason for this is if you mistakingly typed in the wrong user name or password too many times. If that is the case, try again in a few minutes. This type of "ban" expires after roughly 5 minutes. Other reasons for bans are that it was recorded that either you or someone within your network tried hacking in the system; or more than one computer has tried logging in using a single user name at one time which is strictly forbidden and can result in a permanent ban unless you have a corporate or shared subscription. If payment to the site is cancelled or witheld, this can also result in a ban or revoked access. If you have been banned and you believe you did nothing that went against the gallery policies, please e-mail us at support@adpharm.net. What is a Single-User subscription? The Single-user subscription is a purchased access that can only be used by one person. Sharing of the user access details is prohibited as per our user agreement. What is a Shared-User subscription? The Shared-user subscription is a purchased access that can be used by anyone in a given company or organization. It comprises one main user to which the user name and email address will be attached to, plus a number of additional "seats" that can access the gallery at the same time. The number of simultaneous log-ins is determined by the number of seats purchased by the main user. Sharing of the user access details outside of the user's company or organization is prohibited as per our user agreement. If you have purchased a yearly subscription, you can share your user access with colleagues from the same company or organization you are part of. Up to 3 people can log-in simultaneously using your user access. If a fourth person tries to log-in at the same time, they will get a message that all accesses are used and that they can log-in at a later time. Essentially your subscription comprises one main user to which the user name and email address will be attached to, plus two additional "seats" that can access the gallery at the same time. Sharing of the user access details outside of the user's company or organization is prohibited as per our user agreement. Simply go to the search input field present on all of the site pages on the right-hand side menu (when logged-in) and type in one or more keyword(s) (i.e. "cholesterol USA'). The more keywords you put in, the narrower the search results will be (i.e. "cholesterol USA DTC") would give you the same search results as above but narrowed down to only direct-to-consumer ads. For avanced search features, use the advanced search page (log-in required). See details about email alerts here. Yes there are and you can see a list of those on the Sections page. We do and it can be seen here. As we are adding content to our archive pretty much daily, this page is in constant evolution. Please note that not all of the brands available on this site are listed on the brand page at this moment. If a brand you are looking for is not listed, it doesn't necessarily mean we don't have any ads for it in the gallery. Please try searching for it on the search page. There is always a possibility that a search similar to this could bring some false positives in the search results. You can confirm the publication date by looking for the "Publication/Aired" section that is present on each entry as shown on the image below. This is a new feature that was added in February 2015 and it is still being worked on. The taglines page can be accessed via the "Sections" tab in the sites main navigation or you can access it directly here. Not all advertisements have a tagline and sometimes it can be unclear what constitutes a tagline. Usually it's group of words that is close or attached visually to the brand logo. Occasionally an ad may have more than one tagline. We only add the tagline for the main brand in such a situation. A specific taglines search can be done via the search form at the top of the taglines page. 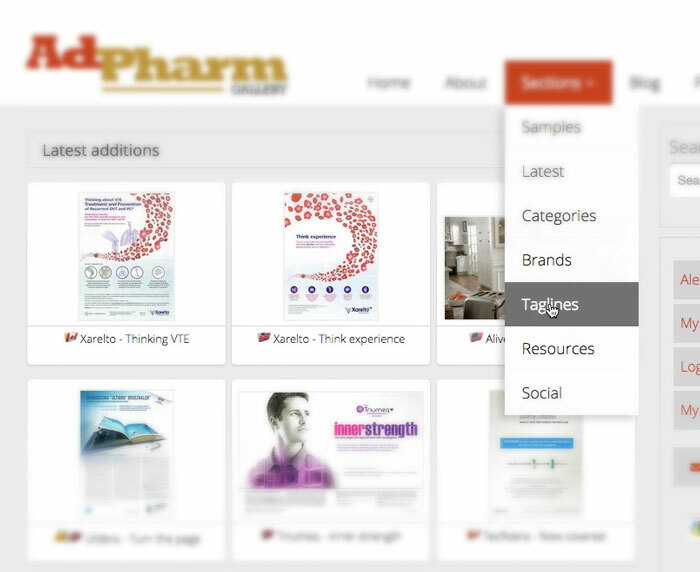 AdPharm’s search engine can only process one search at a time. For instance, if you use multiple browser tabs at one time to do multiple searches, AdPharm will only remember the results of the last search you did. So if you go back to another tab from a previous search, those results will be obsolete and may show you the wrong ad when clicking to get the high-resolution version of the image. To remedy this, simply do one search at a time. Once you have seen or downloaded what you need, then you can do a new search. If you still get errors while searching, please empty your browser cache, quit your browser and restart it. That should solve the problem. "and" and "or" – with "and", if you enter more than one keyword in your search, the results will be narrower than if you select "or" because the search will give you results that have necessarily the two keywords attached to it. Caption - Conduct a search using the caption. Having this selected or not may have a great impact on the quality of your search depending on how wide you want it to be. In the caption are included most of the messaging (copy) for the ad, including headline and tagline, there's also the publication and date (if available), indication, generic name, maker, etc. Keywords - In the keywords section are included most tags that we believe are most important to the user. Most of the words, image details, indication, year of publication, format, therapeutic area, etc. that pertain each specific ad are added manually here. Our "caterogies" list is based on those keywords and we are improving them constantly. Age - Helps the user searching for new or older ads (in terms of the date it was added to the gallery). You can check any of those selections. The more you select, the narrower, or wider your search will become, depending on which of the "or" or "And" selector you chose. Try various combination of keywords with our search features to see what works best. Well, you can use any English word you want. Having said that, as a communications specialist, you may want to search for specific mediums (e.g. print ad, TV commercial, direct-mail, etc.). You may also be interested in seeing only certain formats of print ads (e.g. single-page vs. double-page spread). You may also want to search specific areas of healthcare ads (e.g. cardiovascular, oncology, breast cancer, gastro-intestinal, et or ads for generic vs. branded drugs, ads using illustrations vs. photography, ads using spokespersons or testimonials. The list goes on. Try it on the search page (log-in required).